Sherman Harrill was born in May 11th 1941, Lebanon Missouri. He enlisted into the United States Marine Corps and in 1959 and was assigned duty to Okinawa. He was stationed at Camp Courtney near the village of Tengan. He started in Isshin-ryu from Master Tatsuo Shimabuku who was teaching in Agena located in Gushikawa. Shimabuku called Harrill "Harru." 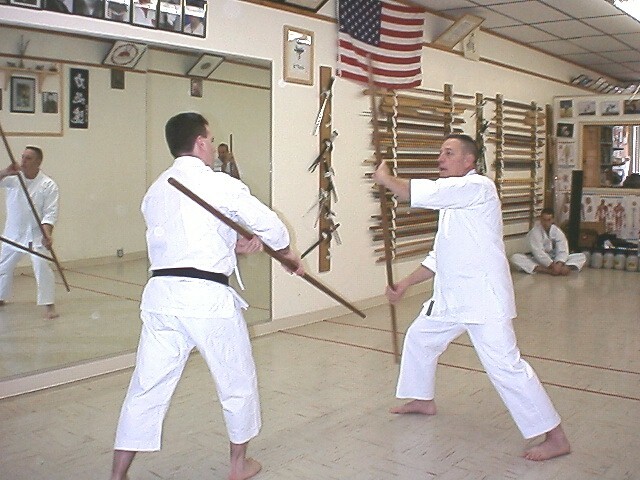 Harru often tells others that he was not the best American training in the Agena dojo at the time but Sherm was not always right. He stated that when he left Okinawa he was entrusted with the rank of Rokudan to wear at a appropriate time. Tatsuo gave a rank certificate's to all Americans at the end of their tour of duty. All were given a silk certificate with the rank of Rokudan (Sixth dan) but were told to wear it many years down the line. All were entrusted to wear Shodan and then to wear the next ranks as the appropriate set of years. The majority came back claiming Rokudan as soon as they returned but Sherman waited the appropriate time designated by Tatsuo. This tells the caliber of a man and while he says he was never the best in the dojo on Okinawa for sure he had integrity. This tells the story of the man. A story of a man who gave his all when he taught Isshin-ryu. 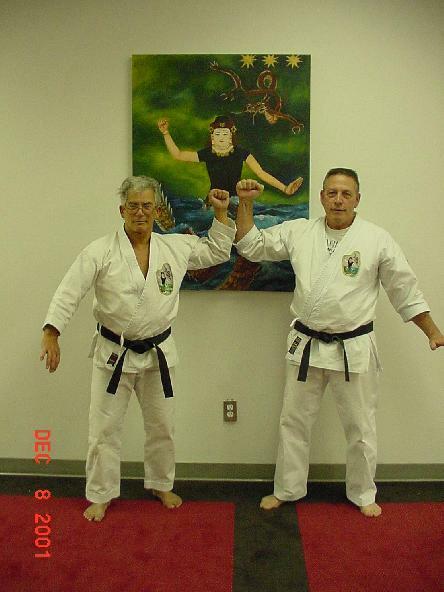 A few years ago when one of his Agena dojo mates, Don Bohan had cancer, Sherm held a seminar to raise funds for him. Yes this is a unselfish man. A man hard as rocks with a heart of gold. His loved ones, friends and students will miss him but as we all know, spirits never die. On November 4, at 10 AM Central time, the year 2002, Marine Sherman Harrill "the Sherminator" was called to duty, to guard the Heavenly Gates. He will report to Tatsuo, and begin training in his beloved Isshin-ryu. He will meet his daughters and other members of his family and friends. No you can not kill a spirit, for spirits never die. Kanpai, my friend, until I relieve you at your post, the Pearly Gates of Heaven. Once in a little pond, in the muddy water under a lily pad, there lived a little water beetle in a community of water beetles. They lived a simple and comfortable life in the pond with few disturbances or interruptions. Once in a while sadness would come to the community when one of their fellow beetles would climb the stem of a lily pad and would never be seen again. They knew when this happened, their friend was dead-gone forever. Then one day, one little water beetle felt an irresistible urge to climb up that stem. However, he was determined that he would not leave forever. He would come back and tell his friends what he had found at the top. When he reached the top and climbed out of the water onto the surface of the lily pad, he was so tired, and the sun felt so warm that he decided he must take a nap. As he slept his body changed. When he woke up, he had turned into a beautiful blue-tailed dragonfly with broad wings and a slender body designed for flying. So fly he did! And as he soared, he saw the beauty of a whole new world and a far superior way of life to any he had known existed. Then he remembered his beetle friends and how by now they were thinking he was dead. He wanted to go back to tell them-explain to them he was now more alive than he had ever been before. His life had been fulfilled, not ended! But his new body would not go down into the water. He could not get back to tell his friends the good news. Then he understood that their time would come when they too would know what he now knew. So he raised his wings and flew off to enjoy his new life!